Donna sent in a very detailed boat name request last week... There is a lot to work with here, so have a read and suggest some boat names! My family purchasing a 32 ft Yellowfin today. We lost our last boat, a Grady White, to Hurricane Ike. We live on Galveston Island, TX. We own a burglar and fire alarm company, Alert Alarms. My dad, the boat's legal owner, is Rip. We love to fish! We are trying to think of a boat name that includes our security company and fishing somehow. 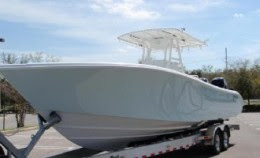 This is not the exact boat, but another 32' Yellowfin we found for sale on UsedBoats.com. Scroll down to suggest a boat name for this family. Ripinfish mike /p irond n.y.